We've taken one of our Easter favourites- Cadbury's creme eggs and turned them into something quite magical. 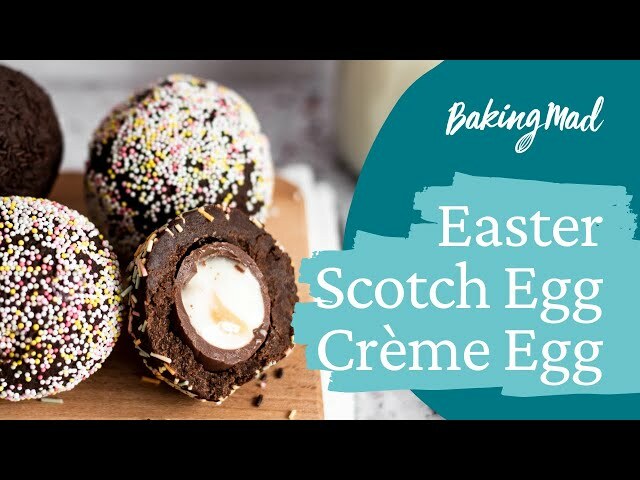 Meet the creme egg scotch egg! Each egg contains a whole creme egg in the middle. We've wrapped ours in our ULTIMATE brownie, alternatively, if you have some cake crumbs left over you can combine this with chocolate buttercream to form a malleable consistency to coat your egg. Here's our ultimate brownie recipe for you to bake before hand. Let it cool completely before shaping. Take your brownie and skim the top off of it to remove all of the loose crumbs. This will ensure you have a smoother mixture to shape around your creme egg. Take a creme egg and remove the wrapper. Use your hands to shape the brownie around the egg ensuring an even thickness all the way around. (We aimed for about 1cm). Once you've coated your egg and smoothed it as best as you can, place it on a baking tray lined with baking parchment. Put this in the freezer for 5 minutes so the scotch egg firms up. Remove the scotch egg from the freezer and then roll in your topping of choice. We suggest chocolate strands, or multicoloured strands for that pop of colour.